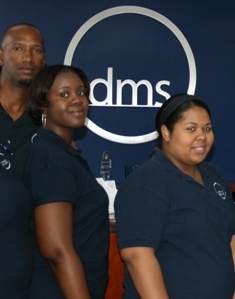 (CNS): Bucking the trend of job cuts and recruitment freezes local business conglomerate dms Organization Ltd. (dms) has recently recruited nine Caymanians to the firm including its affiliates and and subsidiary. Despite the economic recession dms Vice President Krista Pell said the firm is continuing to recruit and is still on the look out for more local talent to join its varied and diverse range of businesses dealing with property and finance. After joining dms in the fall of 2009, Mindy Kimball was promoted in just a few months from Receptionist to Office Services Administrator where she is responsible for planning and administering the policies relating to all phases of operational activity for dms. “With this position came increased responsibility which is something I value as I enjoy rising to challenges. dms is a company that I truly enjoy working for as their commitment to their staff is highly recognizable,” Kimball saidI look forward to many years with the company.” Mindy was previously employed with KPMG as a PersonalAssistant in the Tax Department. Tamika Gilliland has also recently joined dms’ Office Services department as a Receptionist where she says there is ample opportunity for growth which is what attracted her to the company. “An organization that promotes from within and encourages learning and development is just the place for me to get started on my career path,” she added. Valdreen Lindo joined dms as a Finance Administrator during mid 2009 and has been an impactful contributor to the Finance team. Previously Valdreen worked in similar roles at Cayman Surveying and Property Consultants Ltd. and CML Offshore Recruitment. She holds a BA degree in Accounting from the University College of the Cayman Islands. Keeping things close to home, Valdreen’s brother Ian Lindo is also employed with dms Corporate Services Ltd., an affiliate of the conglomerate. Joining the dms Properties team in the summer of 2009, Carney Ebanks has been a welcome addition as the Maintenance Person. He is responsible for ensuring the upkeep of the conglomerate’s marquee properties including dms House, dms Place, dms Centre and dms Broadcasting Centre. Within the dms financial services companies, dms Management Ltd. and dms Corporate Services Ltd. also continue to expand their teams, welcoming Jonathon Doak and Leisha Taylor as Corporate Administrators. In their roles, they administer client needs including administration of official corporation records and financial services transactions. Leisha was previously employed with Ernst & Young (Cayman Islands) as a Client Serving Associate Supervisor while Jonathon recently earned his LLB (Hons) at Cayman Islands Law School. Janine Mitchell has also joined dms Management as a Finance Administrator. Formerly, she was employed with KPMG as an Accounting Assistant. She also previously interned with the Cayman Islands Monetary Authority. Saxon Administration Ltd., a dms affiliate, recently hired Kristin Ebanks as a Finance Manager where she directs all financial management functions and oversees general accounting functions. Previously, she served as the Finance Manger for the Public Service Pensions Board and thus her experience in a similar role will be a great asset to her new role. dms Organization is a business conglomerate engaged in the financial services, real estate and media industries.